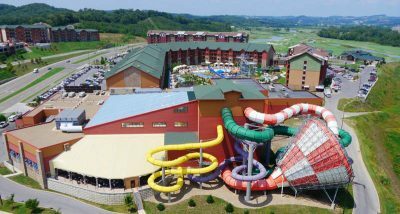 The Wilderness at the Smokies, Smoky Mountain Waterpark Resort is a great place to bring out the youth in you both. If you think the name is a mouth full, wait till you arrive and see the fun, relaxation, shopping, and dining all wrapped up into one property catering to the kids,and grown ups alike. 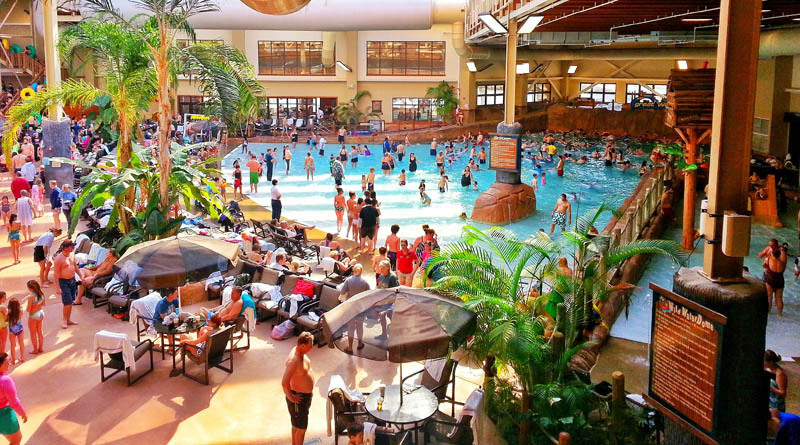 Indoors or outdoors, the enormous waterpark is included with every stay and is spectacular. Most any couple will hang ten on the surfing ride where they have an indoor machine that creates ‘surfing waves’ and people actually ride on water-boards on their hands and knees as if they’re surfing. You get at least 30-40 seconds a turn on this ride until you wipe out enough times. The wave-pool seems to be another favorite with couples as we saw many cuddling on the tubes as they rode the waves together. Visitors of all ages gravitate to the water slides. We were nervous going on the big orange and white toilet bowl at first, but once inside the enclosed bowl, we realized that you never go upside down. Most of the couples we encountered enjoyed, as we did, luxuriating in the indoor and outdoor rock-enclosed spas. There were several and this allowed plenty of privacy away from rambunctious kids. Convenience is key throughout the resort and you will appreciate things like food, clothing, towels, full meals, snacks, and attractions peppered throughout the property so both of you can be satiated no matter the mood, hunger or fatigue level. After a long day in Pigeon Forge and Sevierville it is truly a traveling couple’s oasis to come back to the resort with weary feet and soak and nosh without having to leave the property again. Check out the arcade for more dry fun. More than just arcade games, there’s an indoor zip/rock-hiking type of attraction that hooks you up to a zip-line’s rope (indoors) while you step and swing on obstacles in the ceiling. Ground level there’s plenty of fun as well, consisting of glow-in-the-dark golfing, indoor bowling, indoor rock-climbing, and an secret agent-like laser maze. The guest rooms are ultra convenient with wilderness style, lodge-y décor including extra bathroom vanities, wet bar areas, dual TV systems and surprisingly comfortable bedding and linens. Comfort and convenience are at every turn. Pigeon Forge and Sevierville has everything a couple could want and need for the youthful, fun-centered getaway with Wilderness at The Smokies being the pinnacle in lodging.